Avoid using medications other than metformin to achieve hemoglobin A1c<7.5% in most older adults; moderate control is generally better. There is no evidence that using medications to achieve tight glycemic control in most older adults with type 2 diabetes is beneficial. Among non-older adults, except for long-term reductions in myocardial infarction and mortality with metformin, using medications to achieve glycated hemoglobin levels less than 7% is associated with harms, including higher mortality rates. Tight control has been consistently shown to produce higher rates of hypoglycemia in older adults. Given the long timeframe to achieve theorized microvascular benefits of tight control, glycemic targets should reflect patient goals, health status, and life expectancy. Reasonable glycemic targets would be 7.0 – 7.5% in healthy older adults with long life expectancy, 7.5 – 8.0% in those with moderate comorbidity and a life expectancy < 1 0 years, and 8.0 – 9.0% in those with multiple morbidities and shorter life expectancy. 1-5: The American Geriatrics Society (AGS) established a work group chaired by the Vice Chair of Clinical Practice and Models of Care Committee (CPMC). Work group members were drawn from that committee, as well as the Ethics, Ethnogeriatrics and Quality and Performance Measurement (QPMC) committees. AGS members were invited to submit feedback and recommendations as to what they thought should be included in the list via an electronic survey. The workgroup first narrowed the list down to the top 10 potential tests or procedures. The workgroup then reviewed the evidence and sought expert advice to further refine the list to five recommendations, which were then reviewed and approved by the AGS Executive Committee and the Chairs/Vice Chairs of CPMC, Ethics and QPMC. 6-10: The American Geriatrics Society (AGS) used the same work group from its first list to develop its second list. The group was chaired by the Chair of Clinical Practice and Models of Care Committee (CPMC). Work group members were drawn from that committee, as well as the Ethics, Ethnogeriatrics and Quality and Performance Measurement (QPMC) committees. 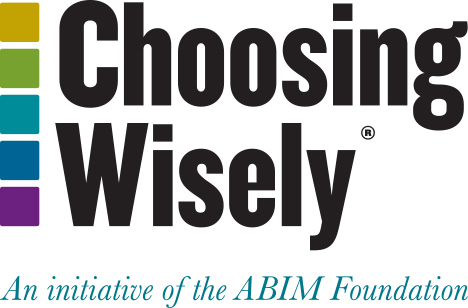 AGS members were invited to submit feedback and recommendations as to what they thought should be included in a Choosing Wisely® list via an electronic survey. The workgroup then narrowed the list down and reviewed the evidence, seeking expert advice to further refine the list to five recommendations, which were then reviewed and approved by the AGS Executive Committee and the Chairs/Vice Chairs of CPMC, Ethics and QPMC. On April 23, 2015, AGS revised items 2,3,6,7,8 and 10. Read more about these changes and rationale. The Action to Control Cardiovascular Risk in Diabetes Study Group. Effects of intensive glucose lowering in Type 2 Diabetes. N Eng J Med [Internet]. 2008 Jun 12;258(24):2545–2559. The Action to Control Cardiovascular Risk in Diabetes Study Group. Long-term effects of intensive glucose lowering on cardiovascular outcomes. N Eng J Med [Internet]. 2011Mar 3;364(9):818–828. Duckworth W, Abraira C, Moritz T, Reda D, Emanuele N, Reaven P, Zeive FJ, Marks J, David SN, Hayward R, Warren SR, Goldman S, McCarren M, Vitek ME, Henderson WG, Huang GD. Glucose control and vascular complications in veterans with type 2 diabetes. N Eng J Med[Internet]. 2009. 360(2):129–139. ADVANCE Collaborative Group. Intensive blood glucose control and vascular outcomes in patients with type 2 diabetes. N Engl J Med[Internet]. 2008 Jun 12;358:2560-72. UK Prospective Diabetes Study (UKPDS) Group. Effect of intensive blood-glucose control with metformin on complications in overweight patients with type 2 diabetes (UKPDS 34). Lancet [Internet]. 1998;352:854-65. Finucane TE. “Tight Control” in geriatrics: The emperor wears a thong. J Am Geriatr Soc [Internet]. 2012 Aug 6;60:1571–1575. Kirkman MS, Briscoe VJ, Clark N, Florez H, Haas LB, Halter JB, Huang ES, Korytkowski MT, Nunshi MN, Odegard PS, Pratley RE, Swift CS. Diabetes in older adults: A consensus report. J Am Geriatr Soc. 2012 Oct;60(12):2342-2356. Hemmingsen B, Lund SS, Gluud C, Vaag A, Almdal TP, Hemmingsen C, Wetterslev J. Targeting intensive glycaemic control versus targeting conventional glycaemic control for type 2 diabetes mellitus. Cochrane Database Syst Rev. 2013 Nov 11;11:CD008143.